By: Sarah Koller of Brit and Co. So you have a shiny new diamond on your left hand; congrats! Now that the bubbly has been popped and the news spread, it’s time to get to the fun part of planning. Over the next few months you’ll be tasked with everything from picking out the perfect linens to finding a DJ that will bring it on the dance floor. With so many big decisions ahead of you, we’re here (just like a trusty bridesmaid!) to help, with Real Brides Ask, a new series that tackles your toughest bridal questions. It’s not exactly news that weddings are a BIG investment, and one of the biggest budget busters is flowers. Whether it’s show-stopping bouquets for the bridal party to elegant centerpieces, it’s easy (soooo easy) to blow an entire budget on your floral dreams. We consulted flower powerhouse Jinger Leonard of Bay-area go-to The Flower House, and she delivered — scroll down for her absolute best tips. Keep ’em moving. According to Leonard, the single best way to get the most value for your blooms is to make them work alllllll day, by moving them between your ceremony and reception. “Reusing the flowers from the ceremony makes [the reception] really grand,” she said. “It’s like getting two things for one price.” To make this work, the florist suggests using looser, layered arrangements on showcase spots like the altar and reusing them as centerpieces. (We think this looks especially great on long, family-style tables.) And there’s more sneaky switches. The flowers secured from hanging jars or other means at the end of the pews can be moved onto guest tables during cocktail hour. Bridesmaid bouquets can double as head table decor. Talk to your florist in advance: Getting her thinking about the specifics of your venue may give you a whole new set of doable moves. And make sure you clue in the event space staff or your day-of coordinator to make sure there’s a plan for who switches what arrangements, and when. Be strategic. The types of flowers you pick have a big impact on the bottom line. And if your dream arrangements include peonies, roses, or orchids, you’ve probably already realized just how much. (Ouch.) But Leonard says you can treat yourself to all your favorite Champagne-taste blooms while staying on your Miller Lite budget — as long as you keep them in one special spot. 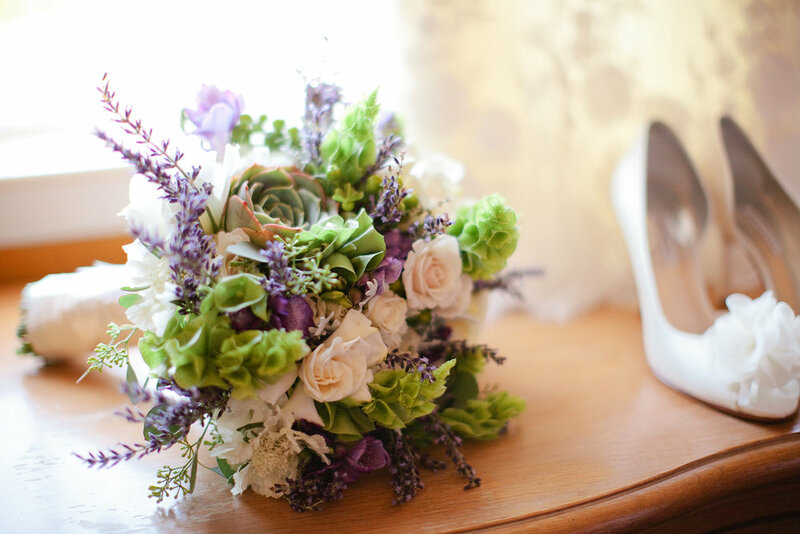 “I take the best of everything she wants and put it in the bride’s bouquet,” she says. The bride’s flowers are typically the most photographed arrangement (and the one you’re gonna see the most), so include all your must-haves there. Using complementary flowers in the same shades for the other arrangements will keep your florals cohesive, but keep your budget from dipping into the red.